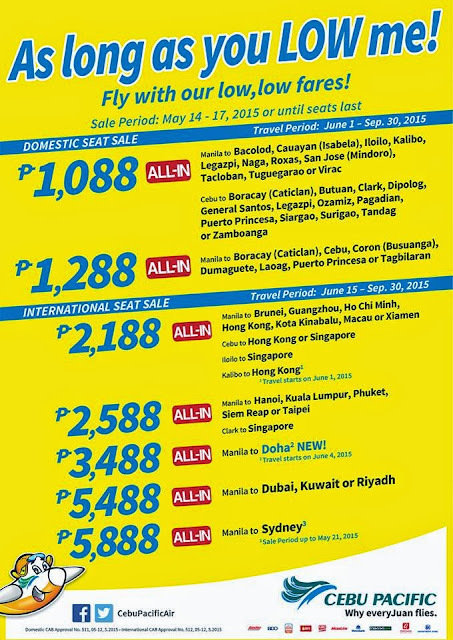 Cebu Pacific Promo Fare 2015: As long as you LOW me! Fly with our low, low fares! Quoted fares are valid for one-way travel only, inclusive of 7 kg hand carry baggage allowance, base fare, web admin fee and taxes collected at point-of-sale. Terminal Fees for non- Manila Stations and Php 1620 international Travel Tax must be paid at the airport. Promo fares have limited availability and are non-refundable but rebookable subject to the following rebooking fees: Php 1,200 for Domestic destinations, PhP 2,000 for Short-haul International destinations and PhP 2,500 for Long-haul International destinations plus fare difference. For your convenience, flight changes, availing of prepaid baggage allowance for check-in baggage and web check-in service can be done up to 4 hours before scheduled flight. meron po bang promo fares this june 8 2015 zamboanga to manila ? Any promo? Manila to Macau ..and also manila to Kuala Lumpur Malaysia? Thanks! 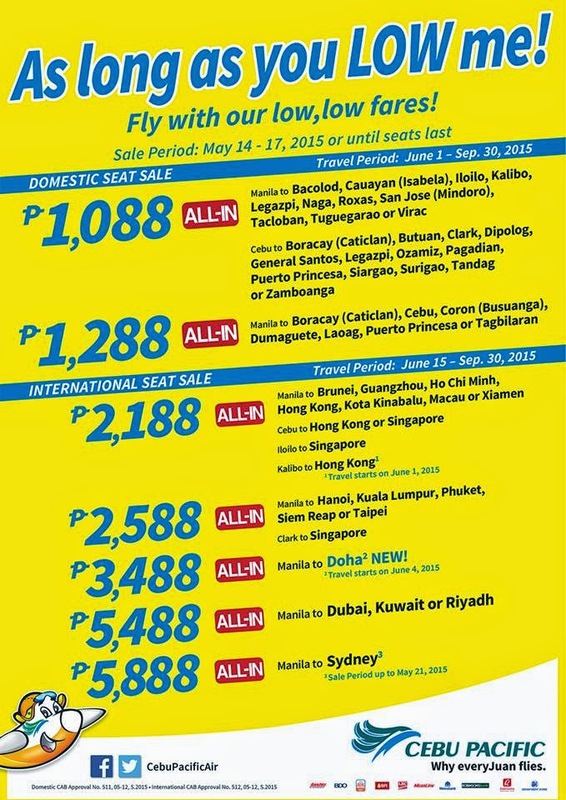 Any promo roundtrip ticket manila to Macau..also manila to Kuala Lumpur Malaysia? How much..thanks! Cebu Pacific Promo Fare 2016 is here!! !